In the interest of documenting the history of transportation in Pennsylvania, the Andruss Library Special Collections has over 30 concerning the history of Trains and Railroads, and over 15 books about Trolleycars and Street Railways. •	HE2791.E677 G73 1994 "Erie Lackawanna: Death of an American Railroad, 1938-1992," (1994) by H. Roger Grant illustrates the developments and themes of the railroad industry. This book goes further than just describing what happened during the fall of the Erie Lackawanna, it also looks at the entire American Railroad enterprise. •	"The Track Going Back: A Century of Transcontinental Railroading 1896-1969," (1969) by Everett L. DeGloyer is a catalog of the exhibition held at the Amon Carter Museum of Fort Worth, Texas in 1969 in commemoration of the 100th anniversary of completion of the first transcontinental railway. This is a unique book that tells the story of the railroad through the use of photographs. It concentrates on showing the railroad in its natural environment, including the climate of the area, and on demonstrating the differences between railroads. The book includes over 100 photographs with detailed captions. •	HE2791.P43 J3 1988 "The History of the Pennsylvania Railroad," (1988) by Timothy Jacobs. The Pennsylvania Railroad carried more freight and passengers than any other railroad in the world for 121 years and covered over 10,000 miles of track. This book explores the rise and fall of the Pennsylvania Railroad with nearly 150 pages of text and illustrations. •	TR715 .R38 2002 "Traveling the Pennsylvania Railroad: The Photographs of William H. Rau," (2002) edited by John C. Van Horne with Eileen E. Drelick; essays by Kenneth Finkel, Mary Panzer, John R. Stilgoe. •	HE5425.P4 A4 "Trolleys from the Mines: Street Railways of Centre, Clearfield, Indiana & Jefferson Counties Pennsylvania,"(1980) by Richard C. Albert describes in detail the different railways traction in the counties listed. It includes maps, diagrams, and a chapter titled "Memories," which talks about the trolley as a part of the community. •	TF1025.L35 H37 2000 "The Lake Shore Electric Railway Story," (2000) by Herbert H. Harwood. In its short 37 year life, the Lake Shore Electric (which ran along the shore of Lake Erie connecting Cleveland and Toledo) was considered by many to be the greatest electric railway in the United States. This book tells the entire story of the Lake Shore Electric including the missed opportunities that could have saved its life. It also includes period photographs and maps. •	TF920 .S88 1995b "Trolleycars: Streetcars, Trams and Trolleys of North America, A Photographic History," (1995) by Frank Sullivan and Fred Winkowski includes photographs and a detailed history and technical specifications of over 50 classic trolleycars. Both Sullivan and Winkowski were well known transportation authors and photographers. •	TF724.P4 R65 1997 "Pennsylvania's Street Railways," (1997) by Benson W Rorhrbeck begins with a history of trollycars in Pennsylvania and then breaks down the individual railway companies and discusses their routes and their histories. The book contains over 300 pages of text, maps, illustrations, and charts, and also includes an index. 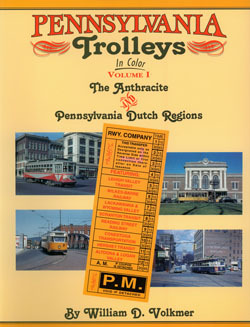 •	TF724.P4 V65 1997 "Pennsylvania Trolleys In Color," (1997) by William D. Volkmer includes three separate volumes; The Anthracite and Pennsylvania Dutch Region, The Philadelphia Region, and the Pittsburgh Region. Each includes rare color photographs of trolley lines specific to the region. At the time of publication, Volkmer was Chief Mechanical Officer for the Tri-County Commuter Rail Authority in Florida. All books in this collection are available in the Andruss Library Special Collections, located in the University Archives area on the 3rd floor of the Harvey A. Andruss Library.